Let's take a moment to marvel at this book being a standalone.. no.. this is not a contemporary book.. and yes.. I'm not tricking you, it really is a standalone *party commences* I know right? such a rare species to witness! I actually went into Cruel Beauty thinking it was part of a series but I am so happy to find out that it is in fact a standalone. Though I must warn you.. I almost labeled this book a disappointment because the beginning wasn't able to capture my interest at all.. however halfway through, I was addicted! I have a bad record with fairytale retellings. There you go, I said it. Till now I have never read a fairytale retelling that I rated higher than three stars. 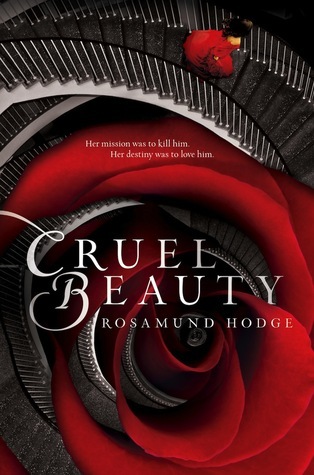 So I was a bit wary when I picked up Cruel Beauty since it is marketed as a Beauty and the Beast retelling. However, I have to say that while reading the book I honestly couldn't really connect it with that fairytale.. so if people are specifically looking for the resemblance, I don't think that should be the reason you pick Cruel Beauty up. The reasons are in fact much cooler, one being this book is set in a completely different world from ours with a historical vibe and is infused with greek mythology and teachings. I found that to be so fascinating and interesting. Cruel Beauty was such a unique novel, I personally didn't know which direction the author would take throughout the whole time I was reading it. I would definitely recommend it to YA fans and just give them a heads up that even if they couldn't connect with the novel initially, they should stick with it and find out why I enjoyed it so much! Standalones are very, very hard to come by and I'm always afraid that it may disappoint me in the ending that I've had previously, that I want to know more or she it to continue more. But hopefully this one will surprise. I love the concept especially with the Greek mythology and teachings they always fascinate me. :) Lovely review Juhina. OOoh nice review! I've been reading soooo many great reviews on this one that if I wasn't already excited about this one I'd likely burst with giddiness! Yeah, I'm weird! I love fairy tale retellings and enjoy them immensely. Sad to hear that they don't tend to be the same for you. But glad to hear that this one was amazing! Great review! An older series that I read years ago--that actually went on a bit more than I realized--was a series by many authors. It was tentatively called the Once Upon a Time series. There were all different books, each one a standalone about a different retelling of a fairy tale. Some well known, others not so much. Like The Storyteller's Daughter by Cameron Dokey! My FAVE though was Snow by Tracy Lynn! You can guess that one's retelling! They are all likely fast reads and all were incredible! It was actually Debbie Viguie's Scarlet Moon that was my first introduction of a Red Riding Hood meeting the Wolf as a Werewolf! And falling in love with him was a definite foresight! Look into that series if you can. You don't have to read all of them, I've read a good chunk of the early ones but not all of the later ones and enjoyed all that I read! There's even a Beauty and the Beast one called Spirited by Nancy Holder. It was VERY different, but I do remember enjoying it. It had Native Americans and Beauty was an English girl taken hostage for some reason...and naturally ends up falling for one of the "enemies" but learns that he wasn't really an enemy! I'm happy that it is a stand-alone, but also sad because I loved it so much :D You know what.. I think I'm going to crack open my favorite fairy tale books and recommend one to you in the hope you end up loving it? Are you willing to take that challenge ;)? I think it's very loosely based on Beauty and the Beast in terms of, sacrifice & falling in love with a monster. But the focus is definitely more on the Mythology aspect. I loved the mix! I'm actually sad to hear that it's a standalone. I love series, and I don't want to let go of a world I've heard is really cool. That being said, Cruel Beauty looks awesome. I'll be sure to stick with it! Great review. I've been reading good things about this book. Thanks for the heads up about sticking with it. Also, the world in this book sounds AWESOME. Like, historical, but not? Sounds like something I would utterly adore. Throwing that in with the fact that this is a stand-alone, and you've totally sold this one to me. Ooh, I'm looking forward to this one. And it's a standalone!! I'm glad you liked it. And I've been trying to read Stephanie Plum once a month as well to catch up. Glad I'm finding others with my reading tastes (makes me feel normal). I really liked it. I didn't know what to expect either and I don't necessarily have the best tract record with retellings either so I was cautiously optimistic. I read a review where someone said they didn't like it because she was too angry but I didn't feel the same way. I think Cruel Beauty has some minor flaws but I still think it's a great story. I love retellings, but again, it can be a hit or miss. Now, Beauty and the Beast retellings? I MUST. Especially this one, I have to get my hands on it!